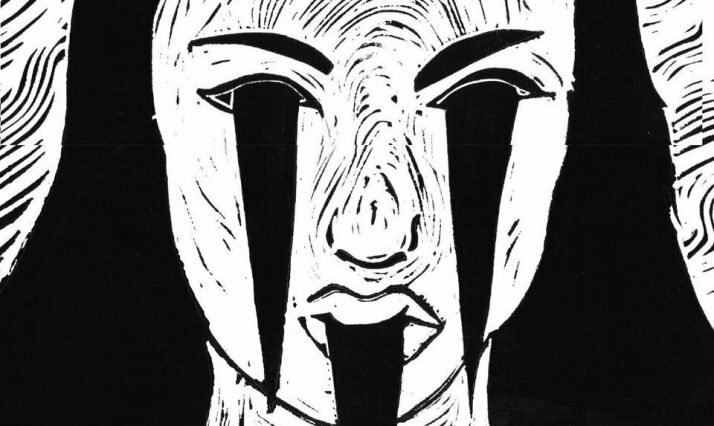 From Friday the 7th of September to the 6th of October 2018, linocuts by graphic novelist Halfdan Pisket will be on display at Muntpunt. Pisket’s so-called “Dane-trilogy” comprises three books: Desertør (Eng. : Deserter) (2014), Kakerlak (Eng. : Cockrach) (2015), and Dansker (Eng. : Dane) (2016). These comics as well as his work in general are inspired by linocuts from the sixties and the seventies. He works with black in a way reminiscent of leftist political art from those periods. The linocut technique has until now served as the main source of inspiration for Pisket’s work; black and white imagery and sharp contours adorn the pages of his trilogy and illustrate the contrasts we meet in his books, which tells the fictionalized story of the life of Pisket’s father, James Pisket. The three volumes of the trilogy tell the story of a Turkish immigrant, who deserts from the Turkish army and flees to Denmark. The second and third books tell the story of the main character’s journey towards creating a life for himself in Denmark and eventually becoming a naturalized Danish citizen. For this exhibition, Pisket has created a number of linocuts based on the atmosphere and picture material from the trilogy. Whereas some pictures are actual frames from the three books, others are recreations of posters that hang within the picture frames in the trilogy, such as Scarface- or Cat Woman posters. All of the linocuts were produced in 30 days during the spring in Copenhagen. In collaboration with the Embassy of Denmark to Belgium, with support from the Danish Arts Foundations.